In August of 2016, I posted “Planner Power”. In the article, I discussed the benefits and importance of writing things down on paper. Which if you are anything like me, unless I have it written down I will not remember it. As we get older, it seems like our memories start to fade and having a planner to write things down, I feel as if my memory is actually improving and maybe I am counter acting the age thing. I realize there are tons of reminder apps, cell phone calendars with alerts and digital calendars that most people like to use. Call me old fashioned but I am a pen and paper girl. I find it quicker and it helps me retain information better once I write it down. I have always taken pride that I was the one person in my family that always remembered everyone’s birthday, anniversary or a special date. It certainly wasn’t because I had a great memory. I did cheat and used a special tool (aka insert) for my planner. I create inserts and forms so it is normal that I would have an insert for my planner with the important dates that I need to remember. I enjoy being able to send a little something to my family each month and brighten their day with a card or sticker. Who doesn’t love happy mail? I wanted to take this opportunity to help you be able to do the same thing and spread happiness with your family and help you never forget another important date again. Below is a picture of the Important Dates to Remember Insert that I am offering in my shop. 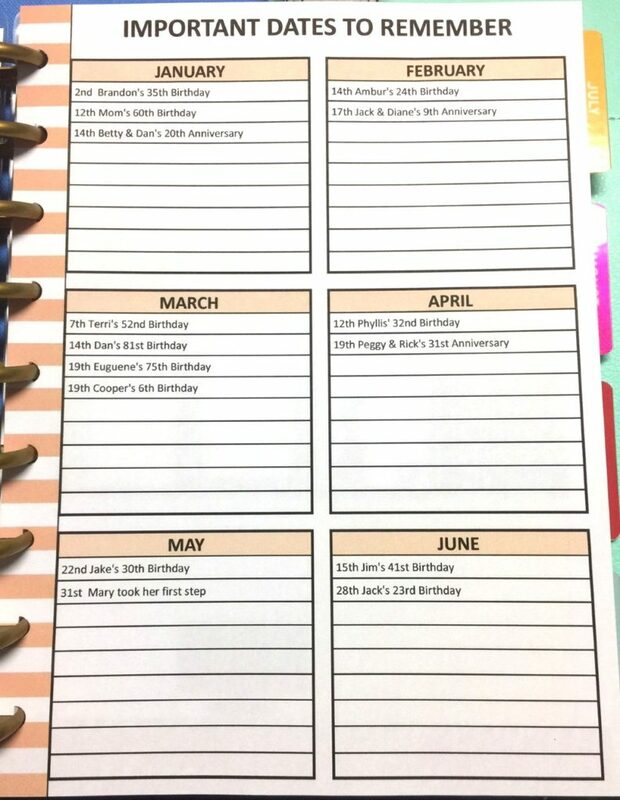 It is available in all sizes of Happy Planner and is editable, which allows you to type in the spaces prior to printing. I like to keep the insert nice and neat because I have horrible handwriting. My handwriting is so bad that there are times I can’t even read what I wrote. To download the Big Happy Planner (BHP) click here. To download the Classic Happy Planner (CHP) click here. To download the Mini Happy Planner (MHP) click here.